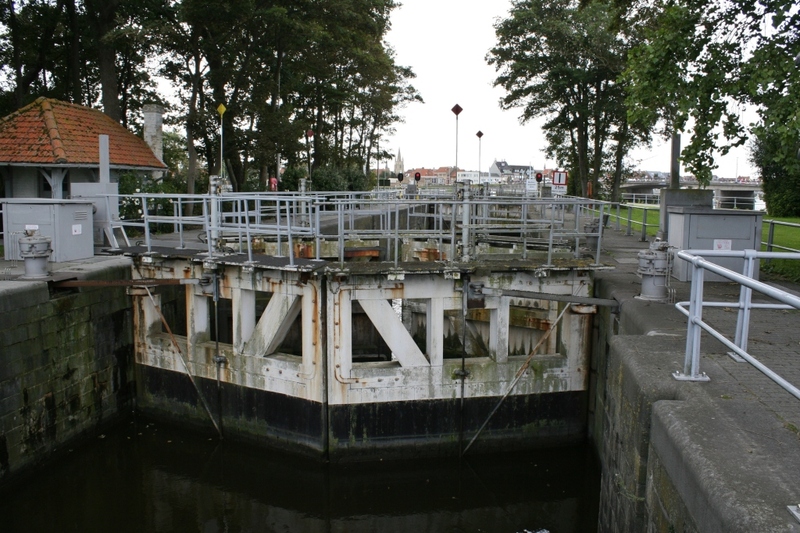 Beneath the shadow of the Albert Memorial, the complex of locks and sluice gates known as the Ganzenpoot (Goose Foot) was to prove crucial to the Belgian Army’s chances of holding the advancing Germans at bay during the late autumn of 1914. 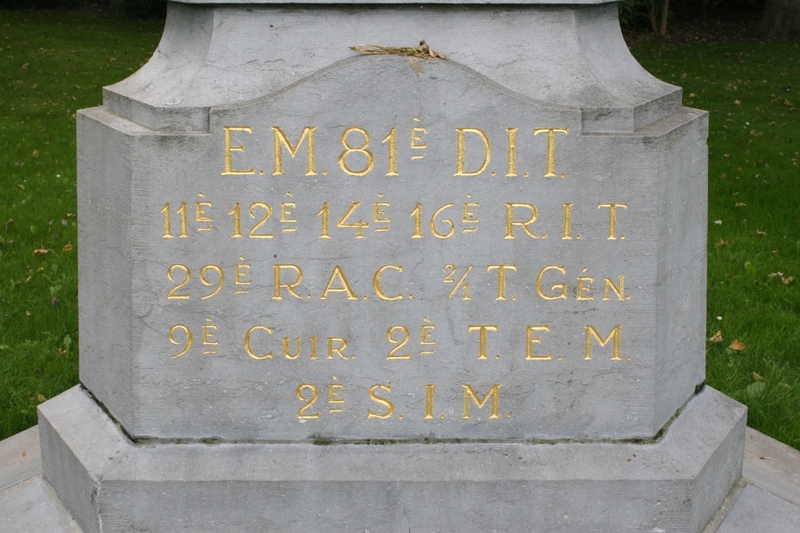 The rearguard action by the Belgians and the Royal Naval Division at Antwerp (see previous post) had bought valuable time for the French Army and the British Expeditionary Force, as well as occupying large numbers of German troops who would otherwise have been free to add their weight to the battles on the Marne and the Aisne. Although Antwerp finally surrendered on 10th October 1914, the bulk of the Belgian Army, some 50,000 men, had by then been withdrawn from the city, retreating west towards the River Yser. There they were busy preparing positions for a last stand, if that was what it turned out to be, between Nieuwpoort on the coast and Diksmuide, some ten miles inland*. 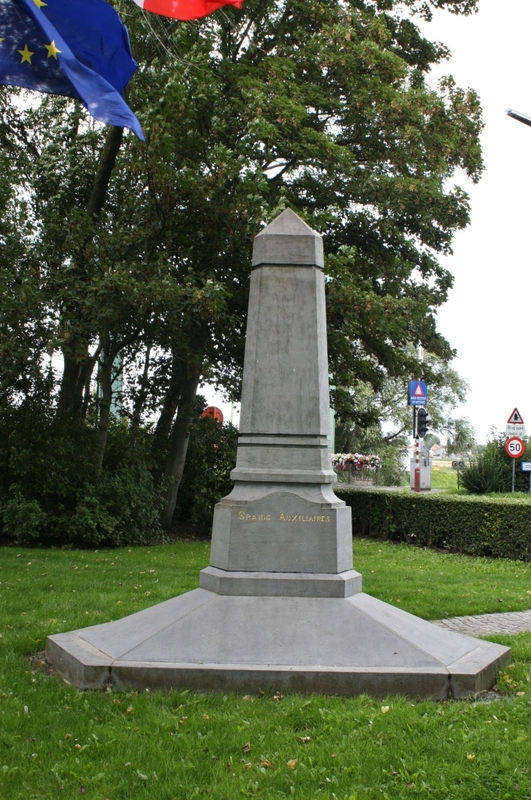 King Albert, commander of the Belgian Army, knew that it would be political suicide to abandon Belgian soil entirely, and resolved to defend this small strip of land to the last man. 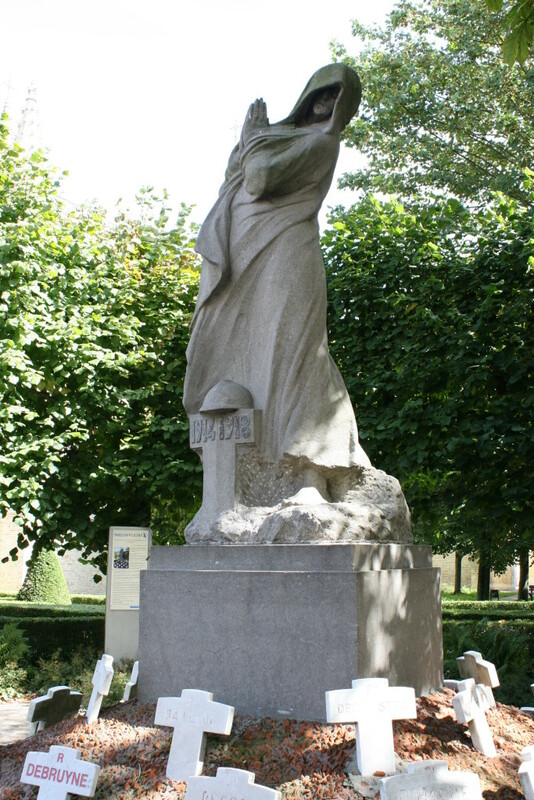 *French troops were similarly engaged between Diksmuide and, further south, Ypres. 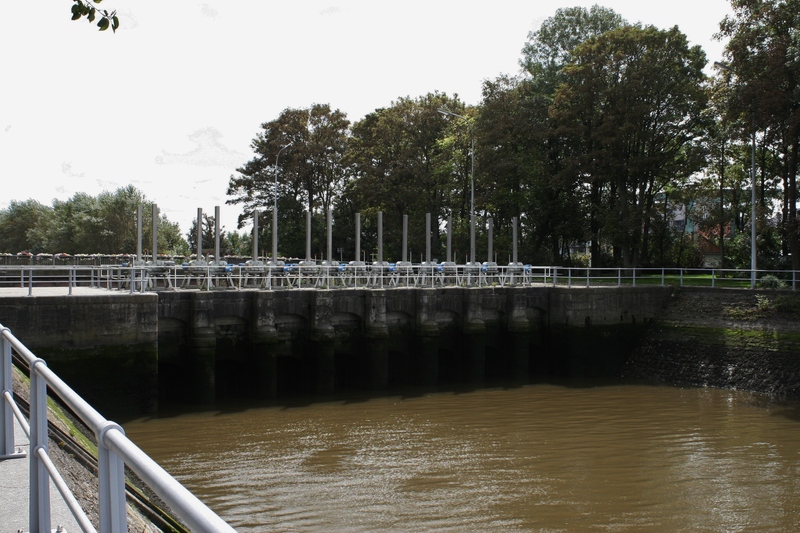 Above: The massive gates of lock 2. 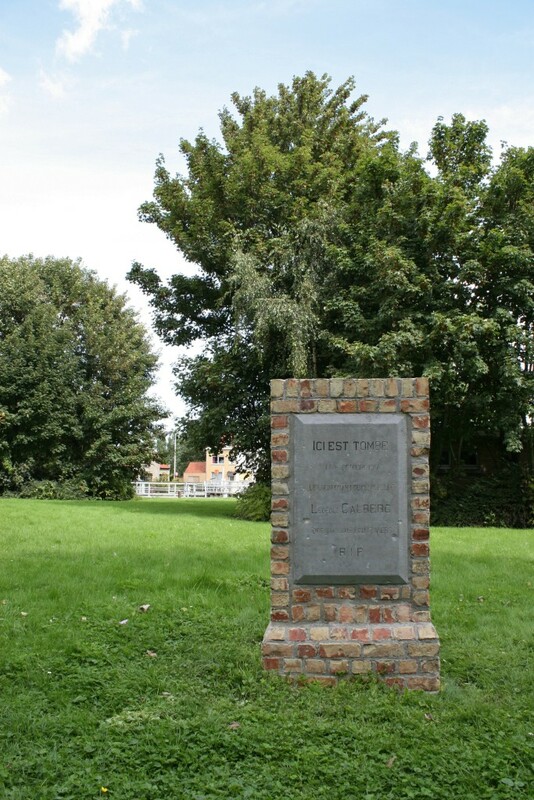 The Battle of the Yser took place between 16th October and 31st October 1914, and at its conclusion, the Race to the Sea, as the series of engagements in the autumn of 1914 are often referred to, would come to an end. On 16th October the Germans, moving their heavy artillery up from Antwerp, opened a bombardment on the Belgian Army between Nieuwpoort and Diksmuide. Over the next week the Belgians, supported off-shore by a British naval force of three monitors and various other vessels, slowly retreated towards the Nieuwpoort – Diksmuide railway embankment as repeated attacks by the Germans gained a foothold on the western side of the Yser. 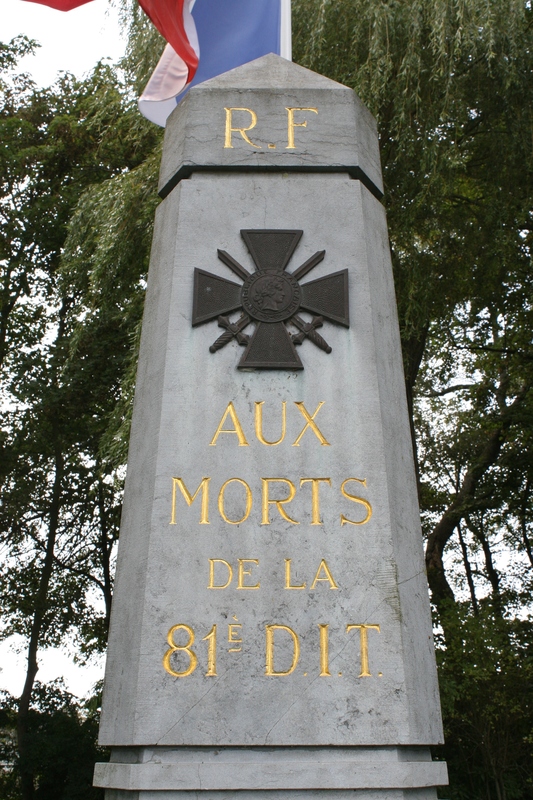 Many of the German troops who were flung at the defending Belgians (by now reinforced by the French 42nd Division) were young, relatively untrained novices who attacked in wave after wave, only to be massacred in their thousands by the defenders. 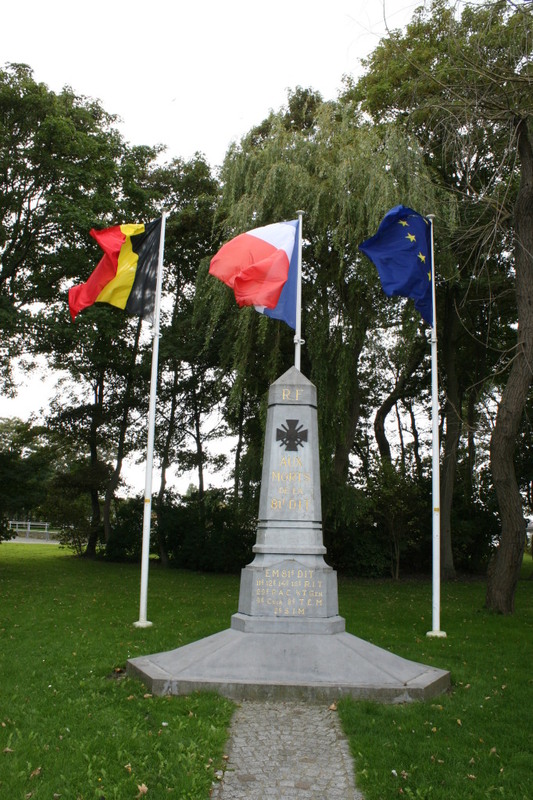 The Slaughter of the Innocents, as the Germans would call it, did, however, increase the pressure on the Belgians to the extent that, by 25th October, the decision was taken to flood the polders to prevent the Germans from breaking through the Belgian lines, a situation that, if allowed to happen, would have potentially catastrophic consequences for the Allies. 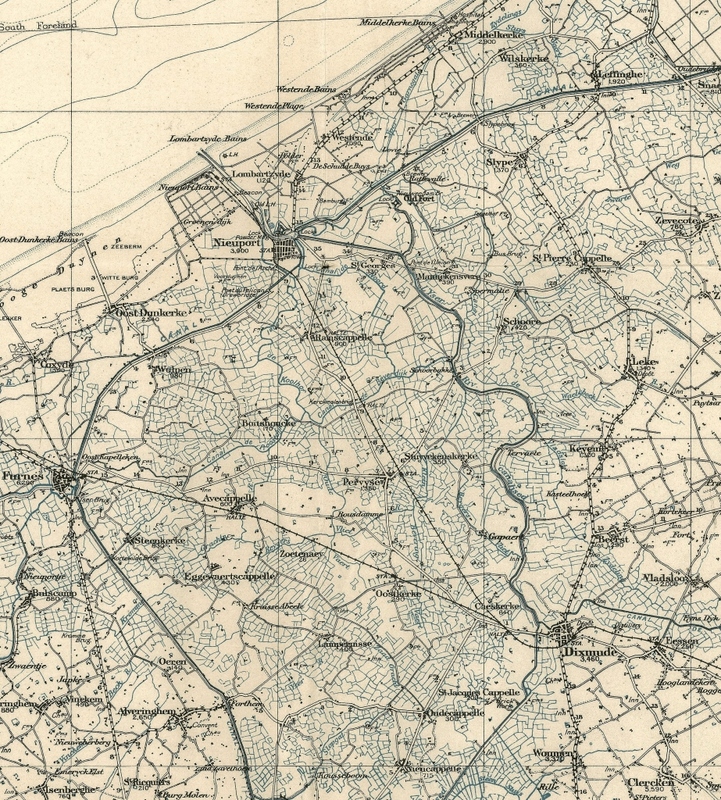 This north west corner of Belgium is land that has been reclaimed from the sea (these are the polders), and as such is utterly flat, save for the banks of the much-canalised Yser, and the embankment which once carried the railway in a dead straight line from Nieuwpoort down to Diksmuide and beyond. The water table here is only just below the surface, and the whole landscape is criss-crossed by numerous drainage channels, as you can see in the contemporary map above. 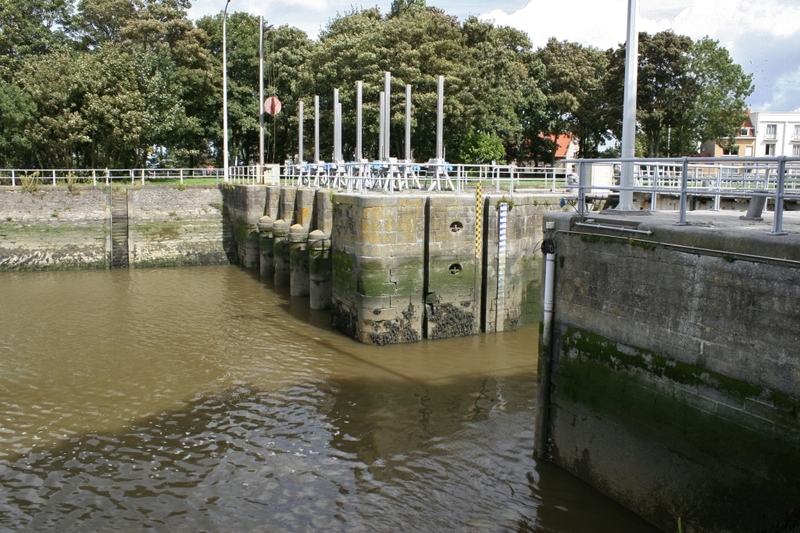 These channels are controlled to this day by sluices and locks which are themselves regulated by the major lock and sluice system at the Goose Foot (also visible on the map – marked as ‘Locks’ to the right of ‘Nieuport’). 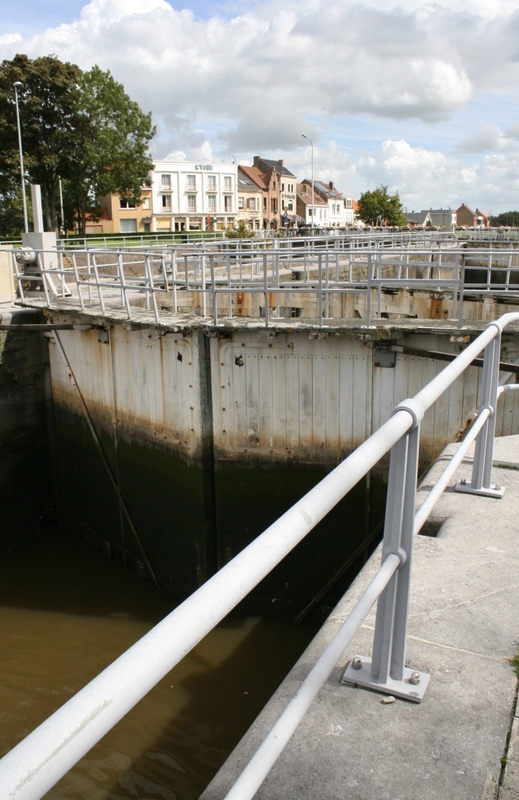 By damming the 22 culverts beneath the railway embankment between Nieuwpoort and Diksmuide, and subsequently opening the main sluice gates at the Goose Foot, the Belgians would be able to flood the whole area between the railway and the Yser, and, providing the water was maintained at a depth too deep for infantry to advance, yet too shallow for boats, the Germans would find offensive operations in this area impossible. 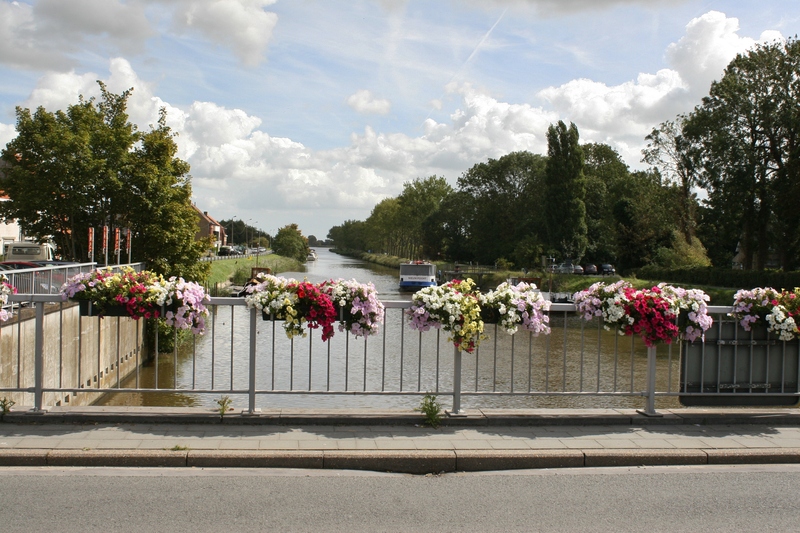 The full story of the flooding of the polders, and the extraordinary bravery shown by both civilian and military Belgian engineers, is well worth researching for yourselves. Work began on blocking the railway culverts on 25th October. 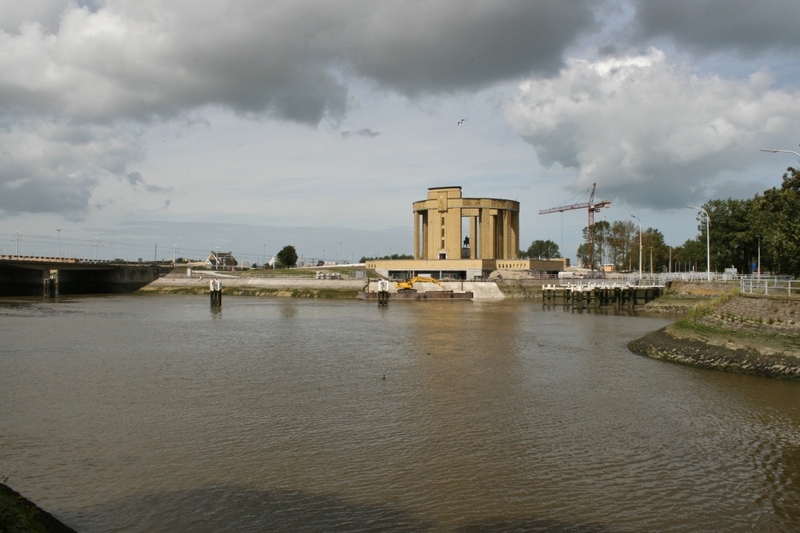 Between 29th & 31st October, engineers took terrible risks at the Goose Foot, by now under German observation but as yet unoccupied by them, as they opened crucial lock gates to allow the high tide through and then closed the gates again some hours later, on three consecutive nights, before the land to the south was inundated to a satisfactory depth. 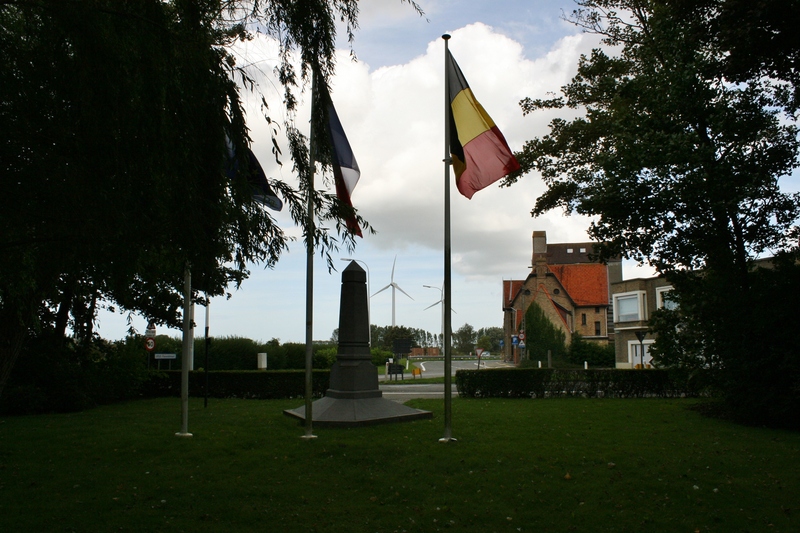 Although the Germans finally took Ramscappelle, just south of Nieuwpoort, on 30th October, a combined Belgian and French force recaptured the village a few hours later, and despite the later capturing of Diksmuide, which would remain in their hands for the rest of the war, on 10th November, the rising waters finally persuaded the Germans that their offensive could continue no longer. The Belgians had succeeded, despite heavy losses, in preventing the Germans from turning the left flank of the whole Western Front. The Germans, retreating back across the Yser, would lick their wounds and turn their attentions south, where the First Battle of Ypres had begun ten days earlier, leaving thousands of their dead, and huge quantities of equipment, in the mire of the inundations. The stage was now set for the static trench warfare that would define much of the next four years of war along the Western Front. So now you know the bare bones of what happened here, and its importance in preventing a German victory in the early months of the war. For the rest of this post we shall stroll around the Goose Foot, taking in the sights as we go. 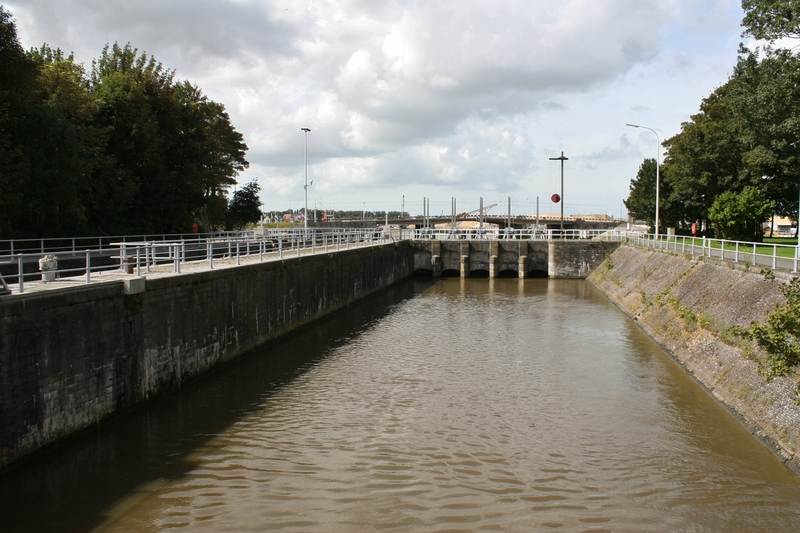 The photo above shows one of the six channels that radiate east and south from the locks here. Starting at the Albert Memorial and working our way clockwise round the Goose Foot, the first three channels (this photo shows the second one) flow in a north easterly direction, serving the areas to the north and east of the River Yser. The remaining three flow south and it is these three channels that were most critical in achieving the successful inundation of the polders. There’s a Google map of the Goose Foot, on which I have marked the positions of the main memorials, that you will find if you click the Tour Maps link at the top of the page. I shall update the map as we continue our travels south. 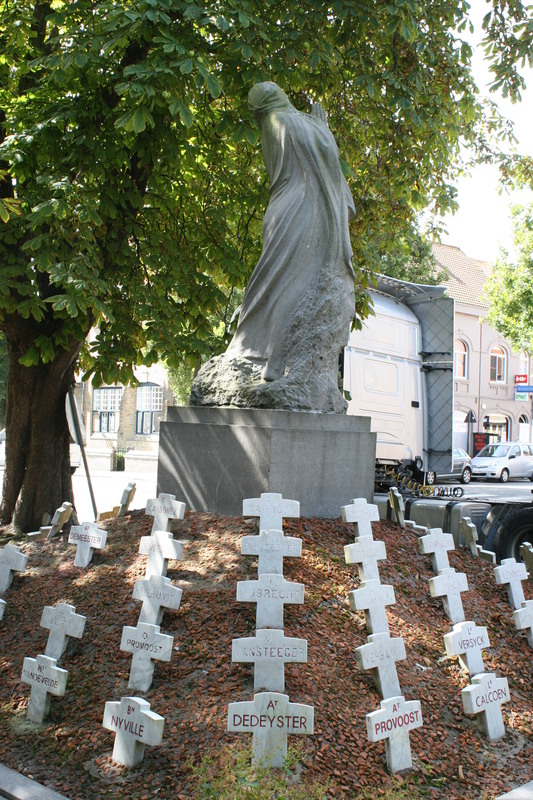 Above & following photographs: This French memorial remembers the men of the 81st Infantry Division who fought and died in this area. Above & below: The third sluice gate. 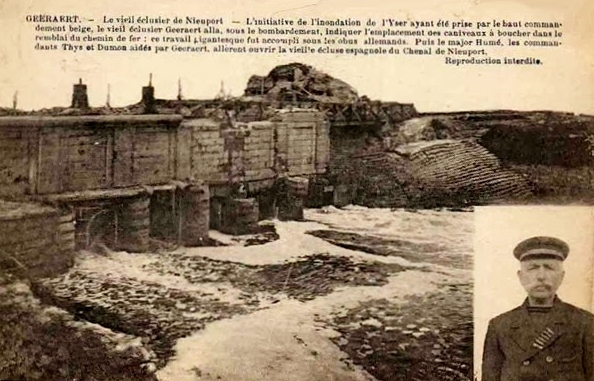 A contemporary postcard showing some of the destruction at the fourth sluice gate. 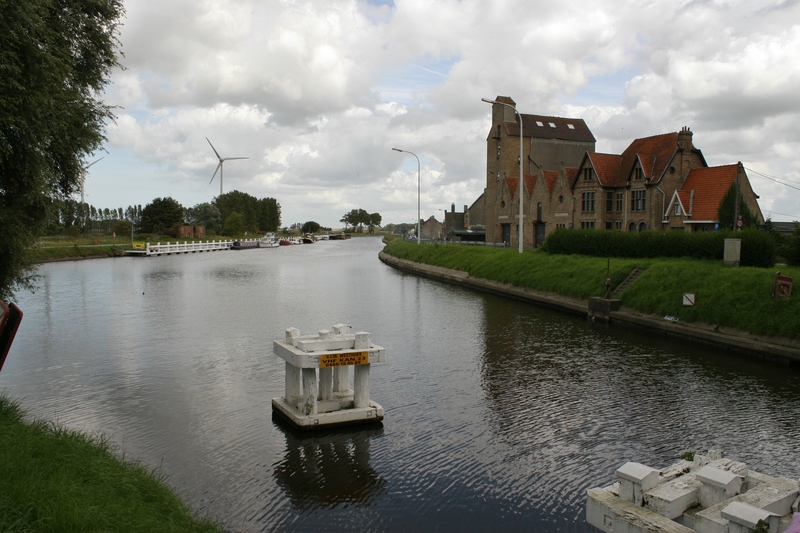 The fourth sluice gate (above) and, below, the start of the River Yser as it begins its meandering journey, first east, and then south, towards Diksmuide and then Ieper (Yper). 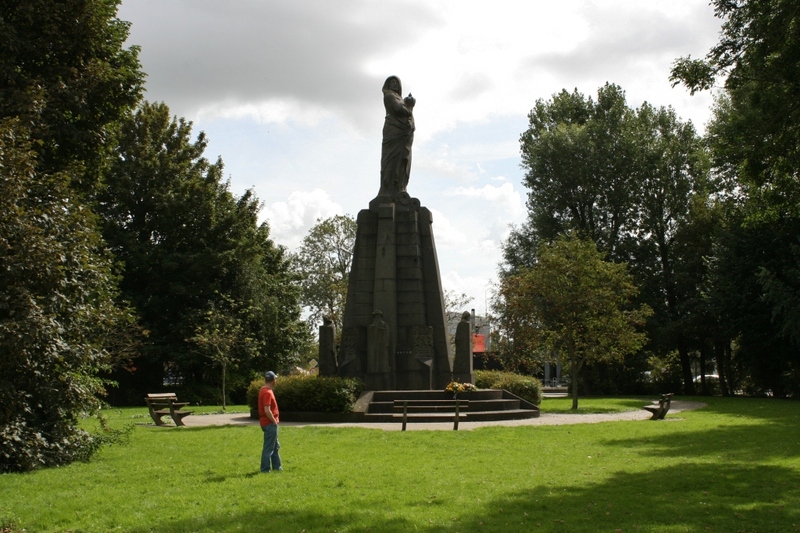 The Yser Memorial stands on the strip of land between sluices 4 & 5. 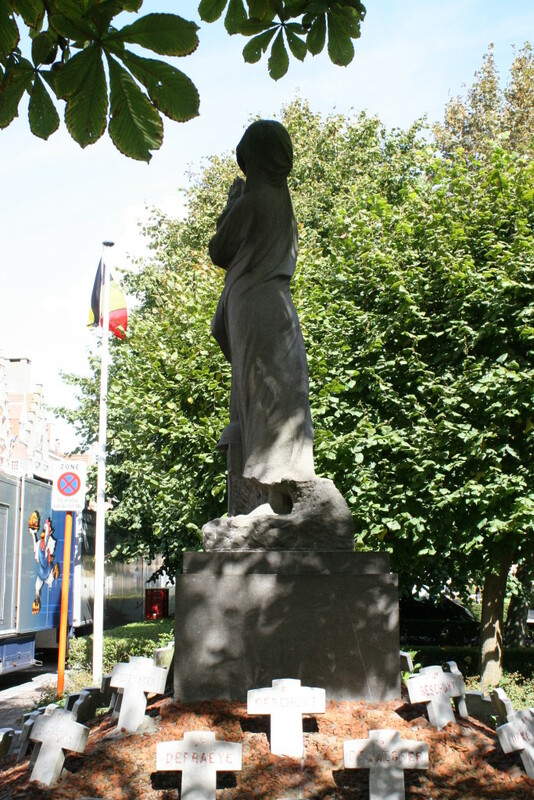 The figure of La Belgique turns away as she shields the crown of Belgium from the eyes of the invader. 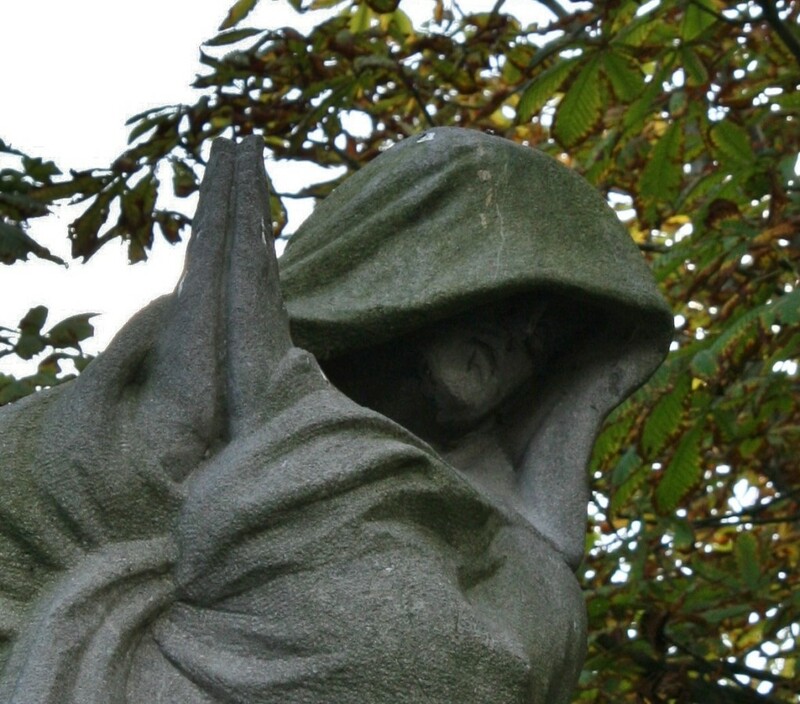 We’ll have a closer look at her in the next post. 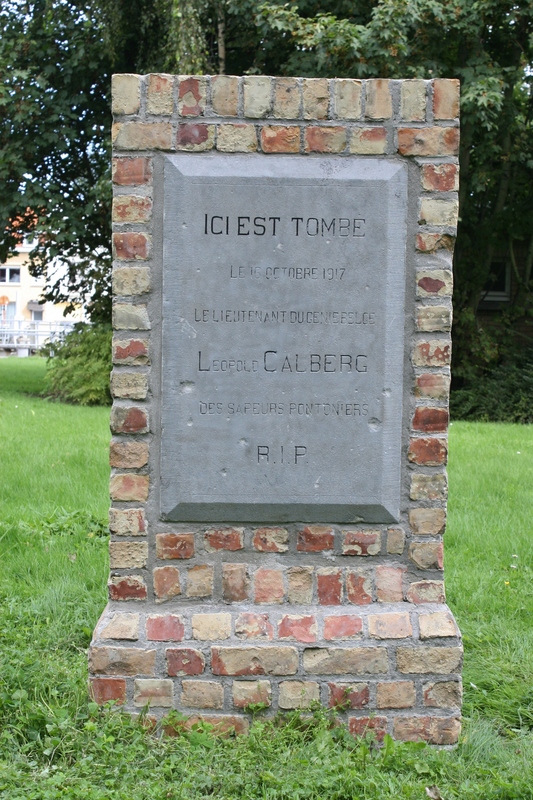 A number of Belgian engineers lost their lives at the Goose Foot, not only at the time of the inundations, but also later in the war, as in the case of Lieutenant Leopold Calberg. 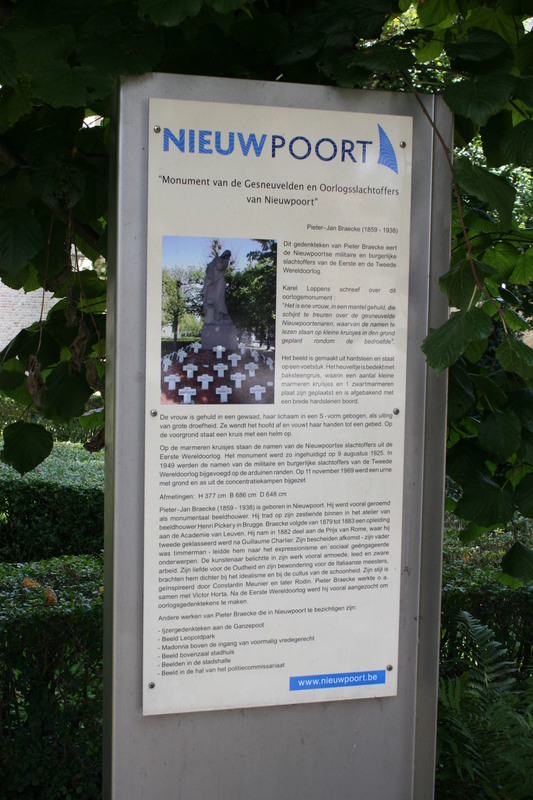 Fighting continued in the Nieuwpoort area throughout the war, and German shells and bullets continued to take their toll on the unwary, unwise, or the plain unlucky. By the end of the war the town itself had been razed to the ground, although the Germans never succeeded in capturing it. Beneath the town and the surrounding sand dunes, and despite the difficulties of digging in sand, a fierce tunnelling war went on with French, British and Australian tunnellers involved here at different times. Today, one hundred years later, the effects on the rebuilt town are being felt and seen as cracks appear on buildings built on filled-in trenches and now-collapsing tunnels. 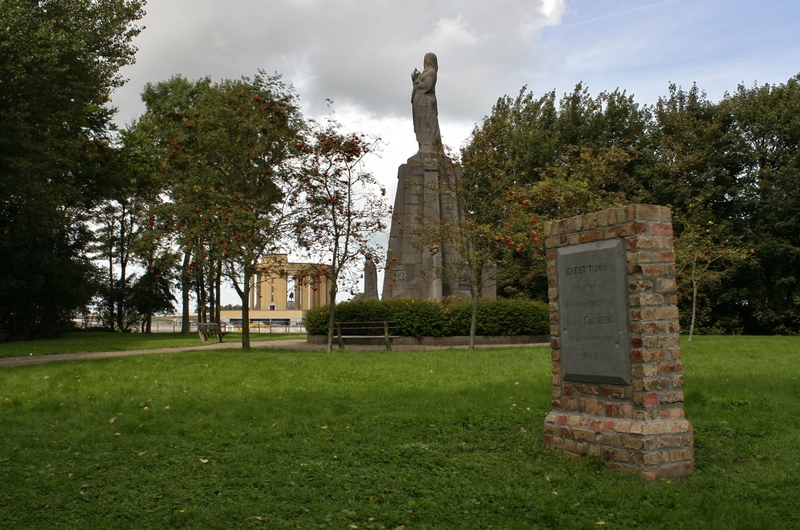 View across the Goose Foot towards the Albert Memorial from near the Yser Memorial. The 5th set of sluice gates. 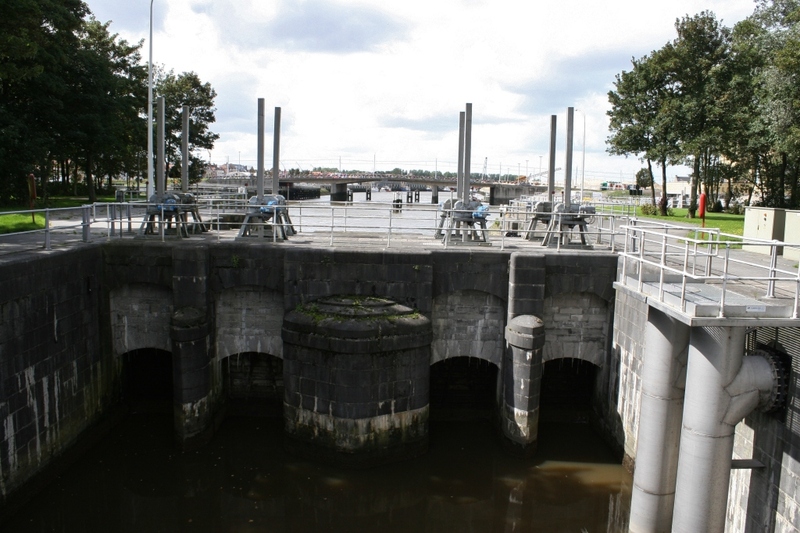 The 5th sluice gates are to the left, and the 6th are out of sight beyond the wooden posts to the right. 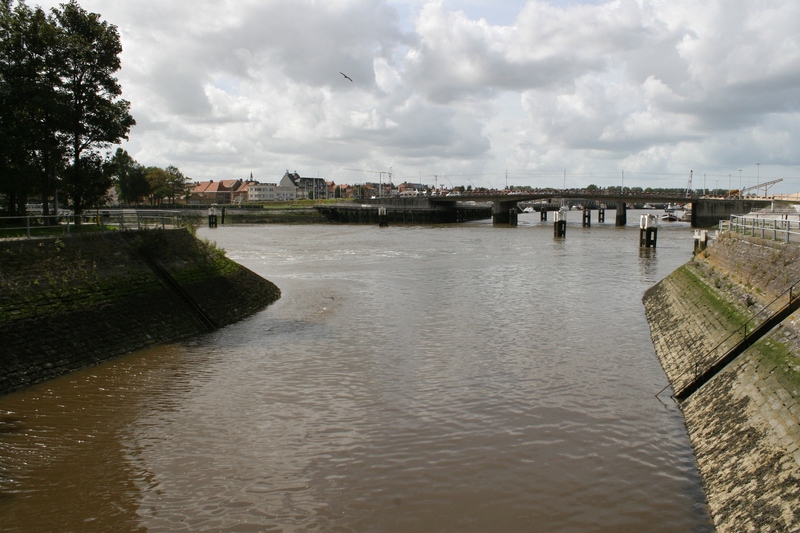 These lead to the two most important southerly channels, which are the crucial ones required to flood the land between the river and the railway embankment. Look at the drainage channel map again and you will see exactly what I mean. 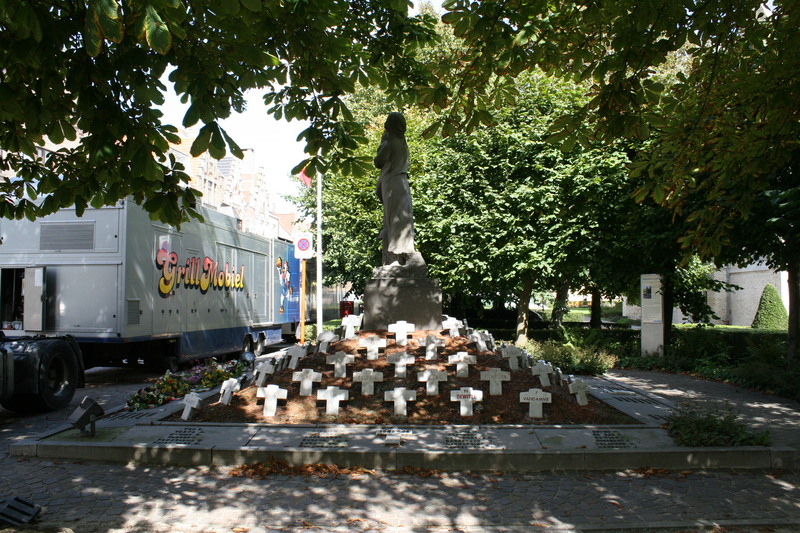 This is the Nieuwpoort Memorial to the Fallen Soldiers and Victims of War. 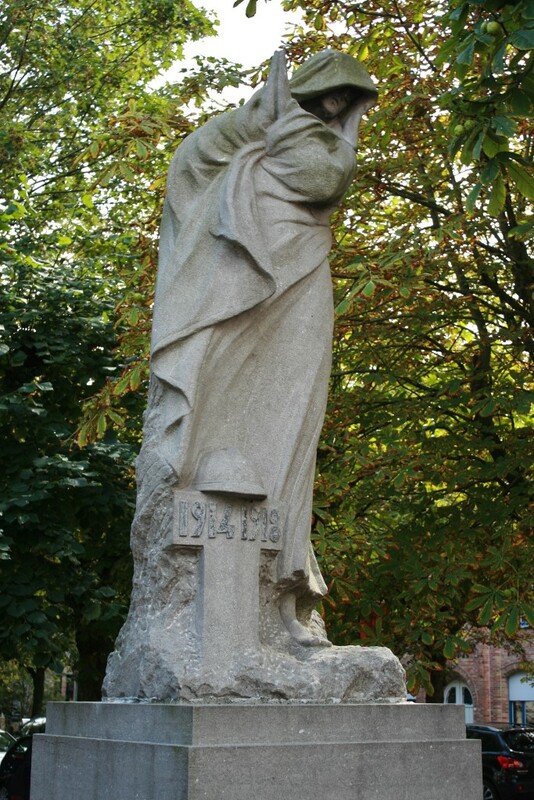 Another memorial designed by the sculptor Pieter-Jan Braecke, the designer of the Yser Memorial, I suspect this too is La Belgique. 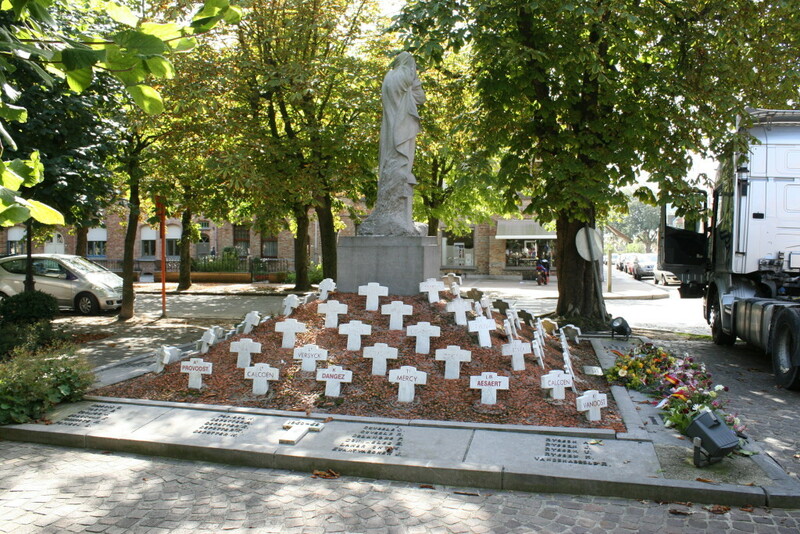 The names on the little white crosses are all men of Nieuwpoort who died during the Great War. 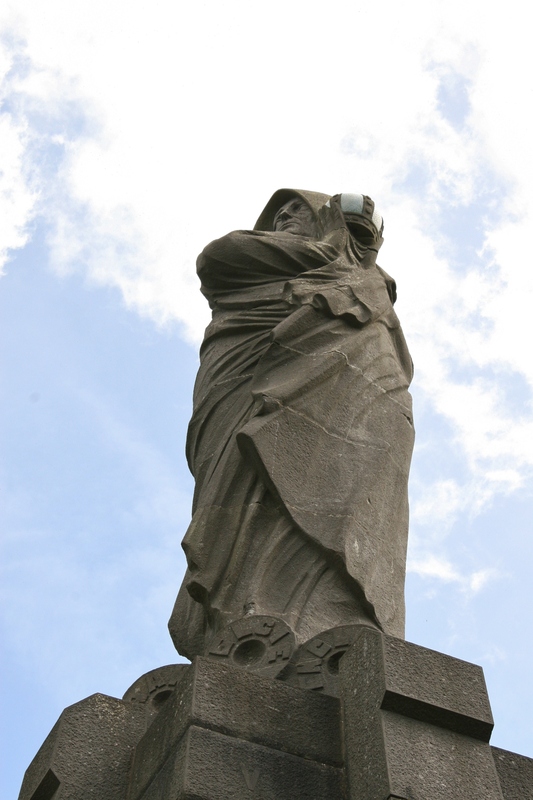 Braecke himself died in 1938, so he never knew about the Second World War names added around the memorial’s base. 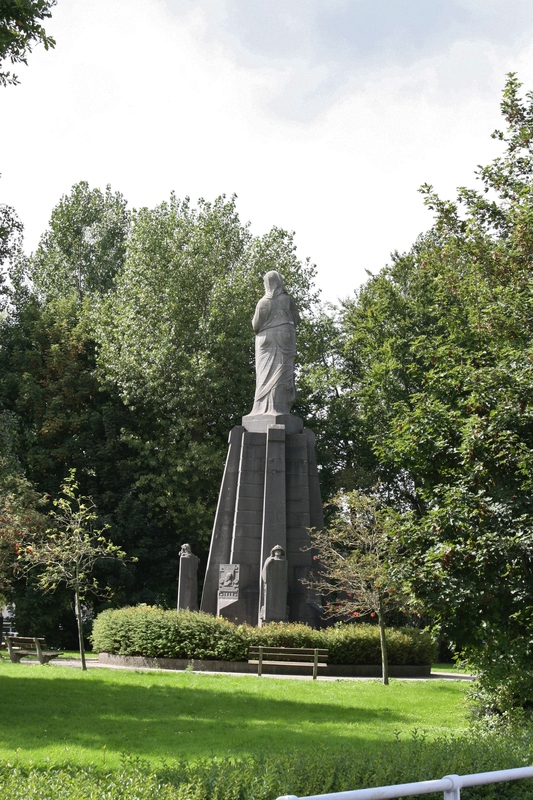 Next: A proper look around the Yser Memorial, followed by a visit to Nieuwpoort Communal Cemetery, a final resting place for British dead from both World Wars.